Photographed by Mike Plagens along Sycamore Creek in the Pine Mountain Wilderness, Yavapai Co., Arizona, USA. 07 June 2009. Notice how the tail is used as a prop to steady the bird as it works to dislodge prey from the wood. Hairy Woodpecker is a characteristic bird of mature woodlands across most of North America. The red patch at the back of the head identifies the bird at left as a male - females have no red. 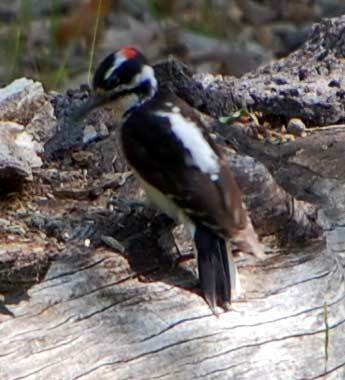 This bird is very similar to the Downy Woodpecker, but is larger and has a much heavier bill. Mature woodlands, including sycamore gallery woodlands, normally have dead and dying trees. The importance of dead trees to the ecology of habitats and to the well being of many birds and animals cannot be understated. Dying trees support tremendous populations of wood-boring beetles and other insects that are the principal food for woodpeckers. The holes punched into the wood by woodpeckers in search of these grubs create entryways for nesting bees, fungi, spiders and innumerable other small creatures. Woodpeckers escavate larger cavities in dead/dying trees for use as nest holes and normally use them only once and construct new ones each year. Thus the dead trees with the help of woodpeckers provide nesting locations for many additional birds and mammals.